This week we have a trace fossil that looks almost exactly like the animal that made it. A trace fossil is evidence of organism activity recorded in the rock record. The photograph above shows one of my favorite specimens: Asteriacites lumbricalis von Schlotheim 1820 from the Middle Jurassic (Bathonian) Carmel Formation in southwestern Utah. I collected it while doing fieldwork with Wooster student Steve Smail too long ago for either of us to mention. This fossil was made when a brittle star (ophiuroid) burrowed into carbonate sediment to either hide from predators or to look for a bit of food. 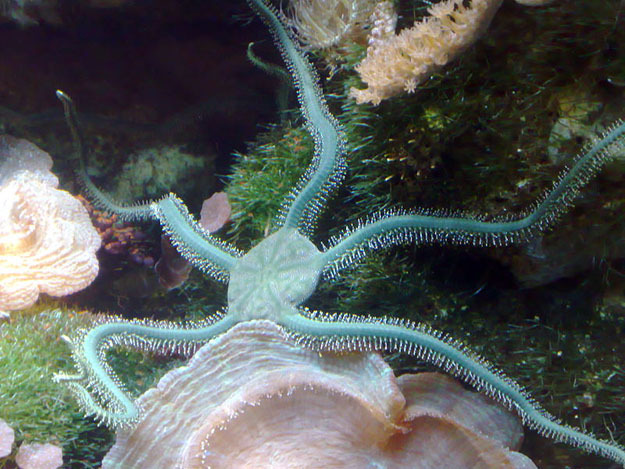 Brittle stars are echinoderms that appeared in the Ordovician and are still very much alive today (see below). This Jurassic trace was formed when a brittle star essentially vibrated its way down into the loose sediment in a manner many of their descendants do today. The result is what appears to be an impression of the body (an external mold) but is actually formed by action of the animal. Green Brittle Star (Ophiarachna incrassata) courtesy of Neil at en.wikipedia. 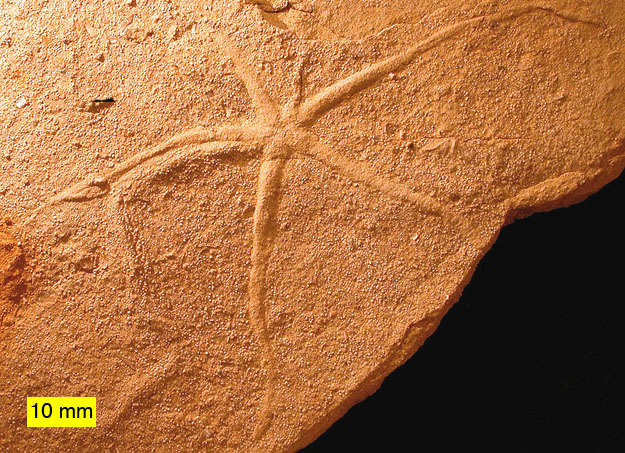 The trace fossil Asteriacites is far more common in the rock record than the brittle stars and seastars that made it. These traces thus often indicate the occurrence of organisms in critical intervals where they would otherwise be unknown. For example, Asteriacites lumbricalis is found in Lower Triassic rocks showing that brittle stars were part of the recovery fauna after the Permo-Triassic Mass Extinction (see, for a Wooster example, Wilson & Rigby, 2000).